What does raising $1 million dollars look like? Are you an entrepreneur looking to sharpen your pitch and prepare yourself for $1M+ in investment capital? 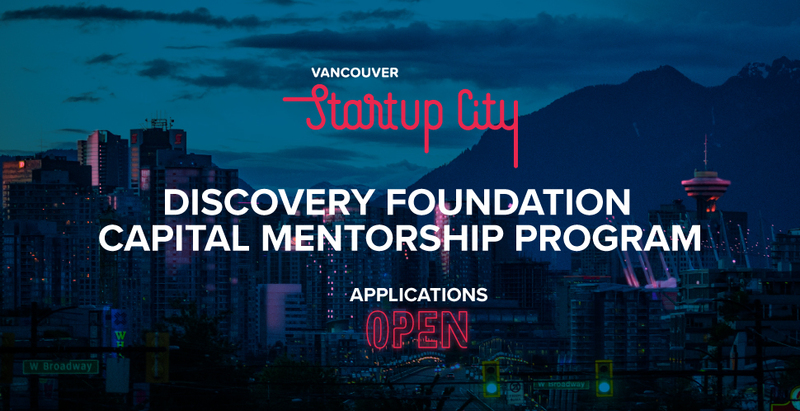 The next installment of the Discovery Foundation Capital Mentorship Program offers three four-week programs for up to 16 entrepreneurs. Each of these programs will test an entrepreneur’s investor readiness through a combination of workshops, seminars, mentor-driven education and peer support. Successful applicants will leave this program better prepared for the fundraising process, and in a stronger position to access deal flow events in Vancouver and elsewhere. Participants in the program will be well-positioned to apply for the ensuing curated and intimate deal flow events. Standout entrepreneurs who impress the selection committees from Vancouver’s top venture capital firms will have the opportunity to engage with groups of investors in deep dive sessions that is conducive to discussion and networking. The Discovery Foundation Capital Mentorship Program is designed to help early-stage, for-profit entrepreneurs become more strategic in raising capital critical to accelerating their ventures. The program is a series of impactful events featuring panels, workshops, pitch training, investor–company matching and networking opportunities. This program will most benefit CEOs and founders of growth-oriented technology, digital entertainment, health, life sciences, and female-led companies in Metro Vancouver who have already launched a product or service. Their companies generate revenue and are ready to seek external sources of funding to accelerate growth; they are planning their investment strategy and are looking to raise over $1M in investment capital in the next six months. This workshop is an intensive 2-hour deep dive into the process of raising capital. This session will provide entrepreneurs with the training, tools, and knowledge to raise the right money at the right time. Entrepreneurs will develop a solid understanding of the process, investment deliverables, and the nuances of getting investor ready. This session is designed for CEOs and founders of growth-oriented startups in all industry sectors across Metro Vancouver. These companies have already launched their product or service, raised a seed round or two, and are ready for the next stage of their growth; they are poised to seek additional external sources of funding, and looking to raise capital in the next 6 months (i.e. working on a new iteration of their original investment strategy). After attending the Insider’s Guide to Raising a Round session on August 7th, interested VR/AR companies are encouraged to apply for entry into the MasterMind Capital: AR/VR cohort before August 12th. Only 16 companies will be selected. The MasterMind Capital: VR/AR program begins with a three-hour deep dive workshop on the capital raising process and the preparations required. Over the following weeks, Spring and other select partners will facilitate two-hour sessions with inter-session support to work through investor profiles and funnels, pitch preparation, due diligence preparation, and negotiation skills. With over 200 entities in the industry, Vancouver’s visual and spatial computing expertise — the result of a 40-year legacy in film & TV, 35-years of leadership in animation and VFX, and over 20 years of games design — is drawing smart companies, talent and capital. In recognition of the rapid expansion of our VR/AR industry, this cohort will be tailored for founders and companies in the virtual, augmented, mixed and extended realities space across BC. Vancouver and BC is home to a robust health and life sciences sector. Well-resourced research universities and leaders in the field provide a strong incubation infrastructure for biotech, medtech and other life sciences startups requiring the deep support necessary to start up. This Mastermind cohort will serve companies working on commercialized projects and technologies looking to meaningfully enhance human health and wellness. Gender parity in decision-making leadership roles isn’t about politics — it is smart business. Vancouver performs comparatively well in terms of diversity in our tech sector: we have a higher-than-average percentage of immigrant-founded startups and companies. However, we still have much work to do. This cohort aims to create an inclusive environment to support female founders and entrepreneurs on their journey to raising capital. Following MasterMind Capital, the top-performing startups will be strongly positioned for the opportunity to be featured at one of multiple investment showcases. Our Investment Showcases highlight Vancouver’s emerging momentum and high-potential companies to an audience of Canadian and US investors. Each startup participating in an Investment Showcase will be rigorously vetted by an independent Selection Committee comprised of key Vancouver investors and investment firms whose portfolios feature sectors and interests relevant to each showcase theme. In a departure from the usual showcase format, successful startups field questions from groups of investors in deep dive sessions. This deal flow format encourages investor engagement and facilitates discussion. Learn more about showcases from previous years and read more about one of the resulting success stories. Details forthcoming — watch this space!